If any one man can be credited for the creation of the Georgia and Florida Railroad, it was John Skelton Williams. From inception it was intended that the G & F would run from Augusta, GA to Madison, FL, with plans to extend the line all the way to the Gulf of Mexico. But when Williams organized the railroad in 1906 it was far from clear to the citizens of Rays Mill, GA (now Ray City) that they would ever get a connection. John Skelton Williams, organizer of the Georgia and Florida Railroad, was the first president of the Seaboard Airline Railroad, and later became U. S. Comptroller of the Currency. Image courtesy of the Library of Congress. 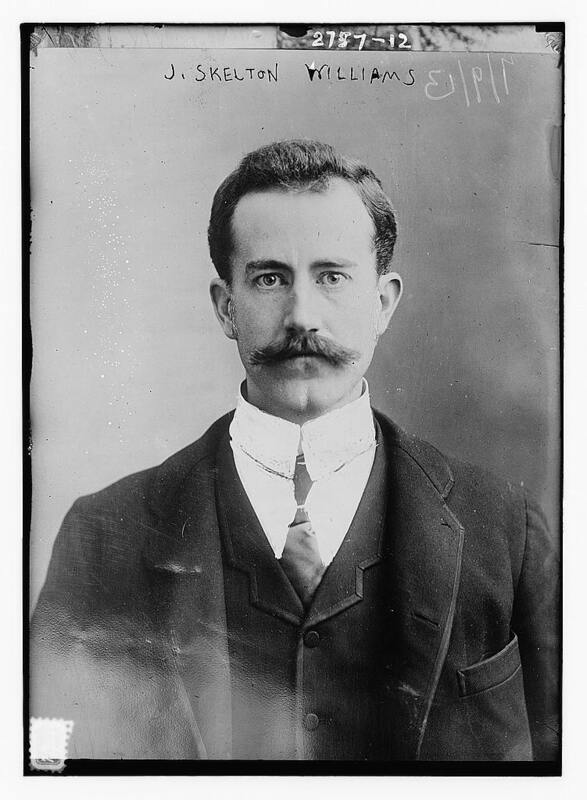 In 1906, John Skelton Williams was already a great power among the railroad men. He was a leading ‘southern financier’ and the ex-president of the Seaboard Air Line railway. One of the “other railroad companies of less mileage” Williams organized was the Georgia and Florida Railroad. In the spring of 1906, The Valdosta Times reported with cautious optimism on Williams’ interest in Valdosta for his new line. At the time, Williams was occupied with consolidating a precursor to the G & F, referred to in the article as the Augusta & Gulf. March 10, 1906 The Valdosta Times reports on the organization of the Georgia and Florida Construction Company by John Skelton Williams. Official Statement in Regard to the Augusta & Gulf Railroad. Messrs. Williams and Middendorf Give Out a Statement of Their Recent Deals and Also Give Some Intimation of Their Plans – Valdosta’s Name is Frequently Used in the Deal, But That is All. The following official announcement from the Manufacturers’ Record relative to the proposed Augusta and Gulf railroad which will be one of the biggest trunk lines in the south, will prove of great interest locally as shown in the scope and certainty of this project. The Georgia and Florida Construction Company, incorporated has been organized at Richmond, Va., for the purpose of uniting and forming a trunk line out of the several Georgia railroads purchased by the syndicate organized by John Skelton Williams of Richmond, J. William Middendorff of Baltimore and their associates. Information from Richmond received by the Manufacturers’ Record says that the Construction Company, with an authorized capital of 50,000 to $90,000, has the following directors Douglas H. Gordon of Baltimore, president, and representing the International Trust Company of Baltimore, which is a member of the syndicate: E. L. Bemiss, vice president, and F. E. Nolting, treasurer, both of Richmond; A. H. Rutherford, of Baltimore, secretary; Albert H. Carroll, of Baltimore, Lewis C. Williams and L. M. Williams, both of Richmond. The syndicate has thus far purchased six railroads in Georgia with a total length of 227 miles. They are the Augusta and Florida 30 miles long, from Keysville to Midville; the Midville, Swainsboro and Red Bluff railway, 20 miles long from Midville to Swainsboro; the Millen and Southwestern railroad, 53 miles line, from Millen via Stillmore to Vidalia; the Ocilla and Valdosta railroad, 55 miles long, from Hazelhurst via Broxton and Ocilla to Irwinville; the Douglas Augusta and Gulf railway, 57 miles long, from Barrows Bluff via Broxton, Douglas and Pinebloom to Nashville, and the Nashville and Sparks railroad, 12 miles long, from Nashville to Sparks. The Millen and Southwestern has a small branch of four miles from Durdenville to Monte. It will be necessary to use only part of some of these roads to form the proposed trunk line. To connect these various properties and make the proposed continuous railroad from Augusta to Valdosta it will be necessary to build links as follows: Augusta to Keysville, about 20 miles, connection between the Midville, Swainsboro and Red Bluff railway and the Millen and Southwestern railroad, about 10 miles; Vidalia to Hazelhurst about 25 miles: total, 80 or 90 miles of new construction. The proposed extension from Valdosta southeward is not yet definitely decided upon. The object is to reach the Gulf of Mexico, and this may be done by building to Tallahassee to connect with the Georgia, Florida, and Alabama railway, which would take it to the port of Carabelle or a direct line south might be chosen. From 50 to 60 miles of new line might be required. Come summertime, Williams had his railroad chartered and funded with a million dollars in capital. By this time it was clear that Nashville, Berrien County and the Wiregrass stood to benefit from the new railroad. 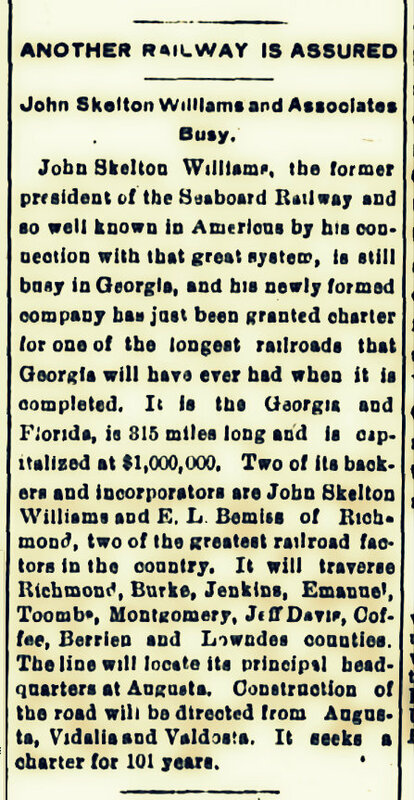 July 13, 1906, The Americus Times-Recorder reports that John Skelton Williams has received a charter for the Georgia and Florida Railroad. 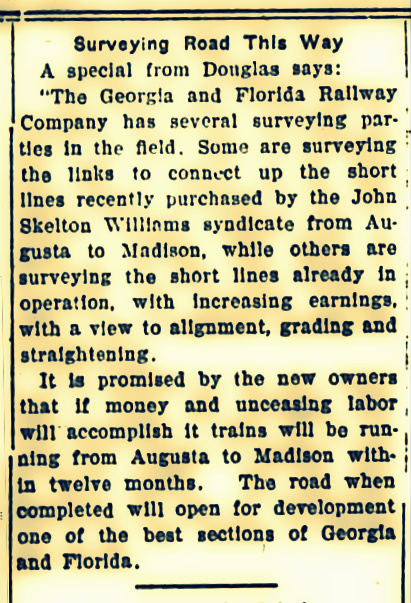 By September, 1906 surveying was underway to determine the route the Georgia & Florida would follow from Augusta, GA to Madison, FL. But it appeared that the main trunk line of the G & F might pass east of Berrien County. The Valdosta Times, September 15, 1906 reports Georgia and Florida Railroad has surveyors in the field. But by the following summer, July 1907 it began to look like the trunk line of the Georgia & Florida would include construction of a connecting line from Nashville to Valdosta. No doubt the residents of Rays Mill began to contemplate the possibilities. Next up, Rays Mill Wins Route for the Georgia & Florida Railroad. Rays Mill Wins Route for the Georgia & Florida Railroad.